Tanner Conant Class of 2015 finished his first LA Marathon! Feb 16, 2019 - Jameson Mora (Class of 2002) won his age group (35-39) at the Austin Texas Marathon with a time of 2:20.22. Caleb McClain (Class of 2015) had season bests of 30:35 in the 10k and 14:37 in the 5k at University of San Francisco. Cole Mears throws Javelin 200 feet 11 inches. Caleb McClain had season bests of 30:35 in the 10k and 14:37 in the 5k at University of San Francisco. 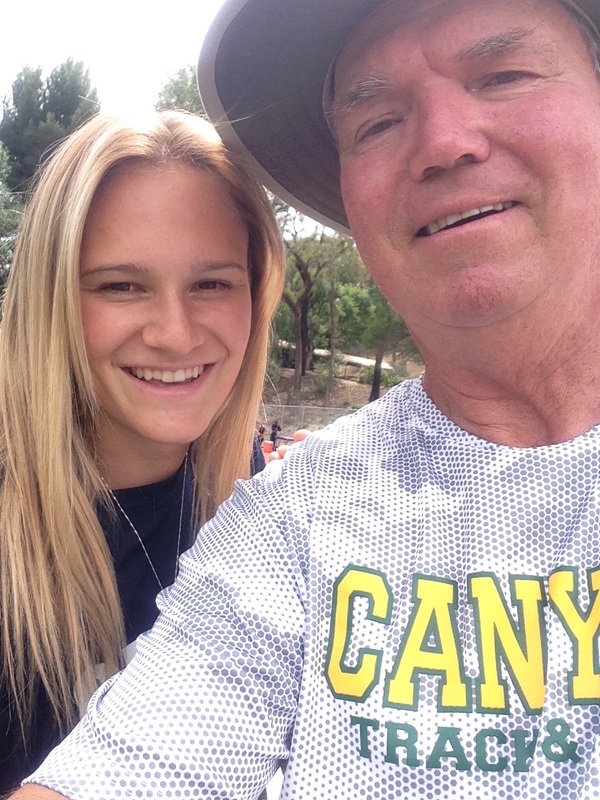 Congratulations to Kalyn English who just became Dr. Kalyn English who just graduated for Medical School in Oregon. 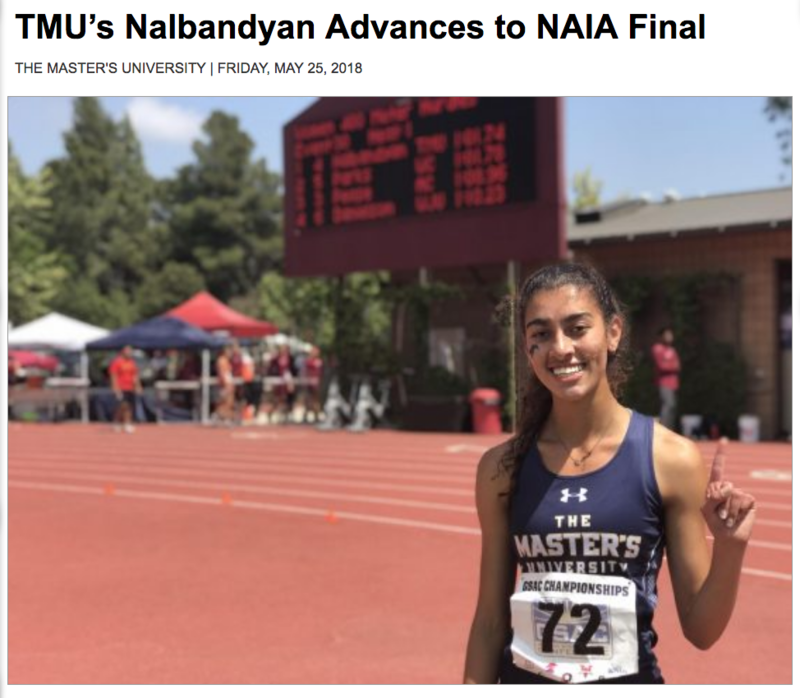 ALUMNI UPDATES: (Feb 11, 2017) American Alysia Montaño will receive bronze medals for her races at the 2011 and 2013 world championships. I just watched Alysia place 2nd in the 500 m at the Millrose Games. The winner set an American Record. The Olympic Champion placed right behind Alysia in 3rd. 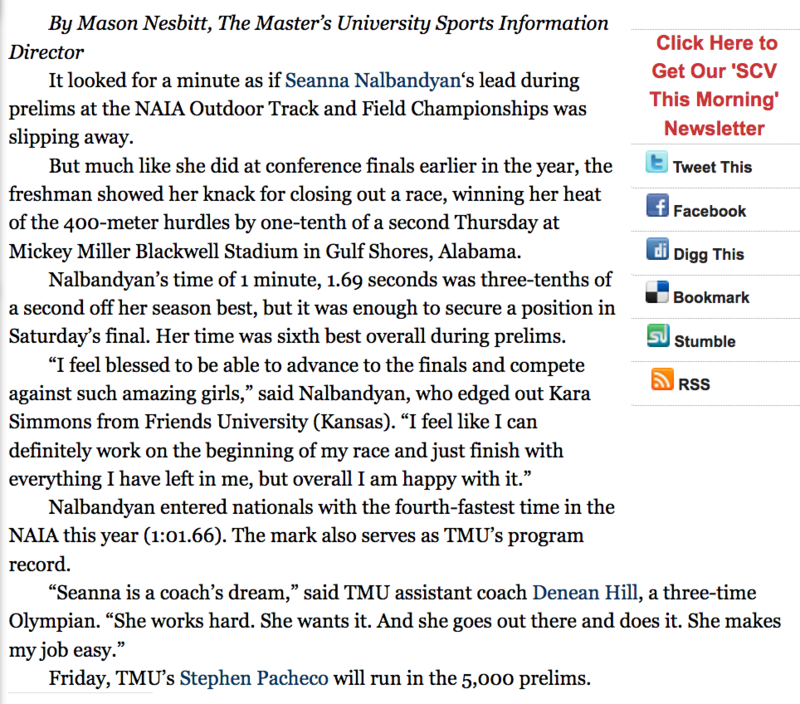 Another Article about Alysia's medals. 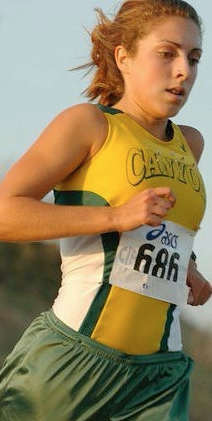 Chris Low is now a professional runner sponsored by Brooks Elite! This Saturday he went to Seattle where he ran the 800m in the Husky Classic for a PR for indoors of 1:49.75. He Came back Sunday at the University of Washington Open and won the 600m. First time in a 600m race so again a PR of 1:17.49. Chris just missed the 800 Auto-Qual time of 1:49.5. But he hit the Auto-Qual time (1:18.00) for the US Indoor Championships in his 600m race. So he will be heading to Albuquerque for the meet on March 3-5. He will be entered in the 600m. 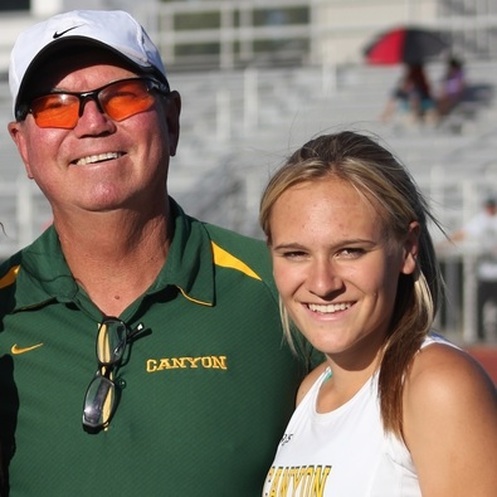 Alumni Updates: (May 14th) Caleb McClain (San Francisco) placed 7th out of 43 runners in the West Coast Last Chance meet runnning a 14:44.0 PR in the 5,000m. Jeremy Kimmer (Glendale Col) PR'd in the Pole Vault at 15-10 and High Jumped 6-7 to qualify for the State Meet in both events next Saturday. Alumni Update (May 9th) Alysia Montano was on ﻿﻿﻿﻿﻿60 Minutes﻿﻿﻿﻿ ﻿last night discussing the Russian Dopers. (May 7, 2016) Chris Low won his 800m heat at the Oxy Invite in a time of 1:48.47. (May 3, 2016) Mari Kneisel Long Jumped 17-11.75 for COC in the WSC Championships. She will next go after the school record of 18-6 set by Valencia's Jasmin Hall. BTW the mens championship went to Questa with 139 points, COC 2nd 137, Glendale 3rd 123. in the womens meet, the chapionsionship was won by West LA with 177.5, COC 2nd 167, Glendale 5th 54. 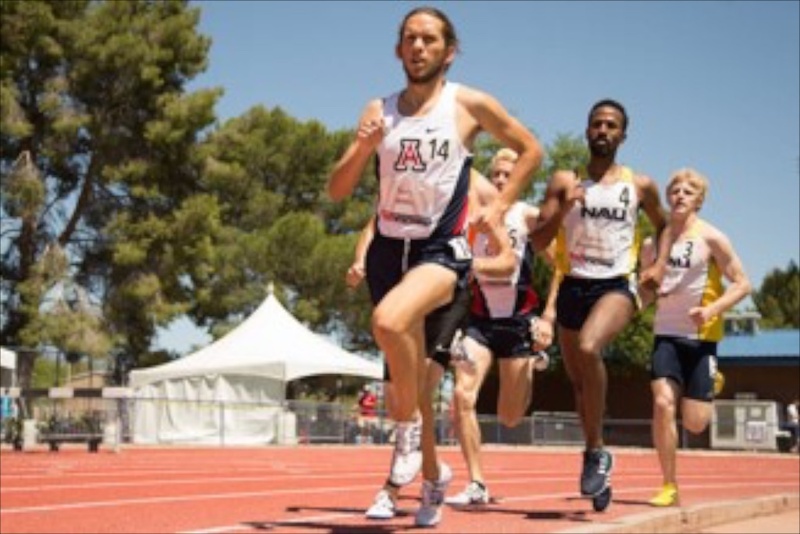 Alumni Update (April 9, 2016): Sam Willis ran a PR 3:48.94 in the 1500 meters, Saturday for the University of Arizona in the Jim Click Shootout. Jeremy Kimmer won the High Jump (1.9m), Pole Vault (4.41m) and placed 2nd in the Javelin (40.31m) behind Cole Mears (46.62m). Dana Bowers won the Javelin (31.33m), the Shot Put (10.79m) 2nd in the Discus (33.16m) Third in the Hammer (34.54m) and 5th in the High Jump (1.45m). Joel Estrada won the 800 m at 1:56.74 and was 3rd in the 1500 4:04.00. Latest Alumni Updates: April 1. 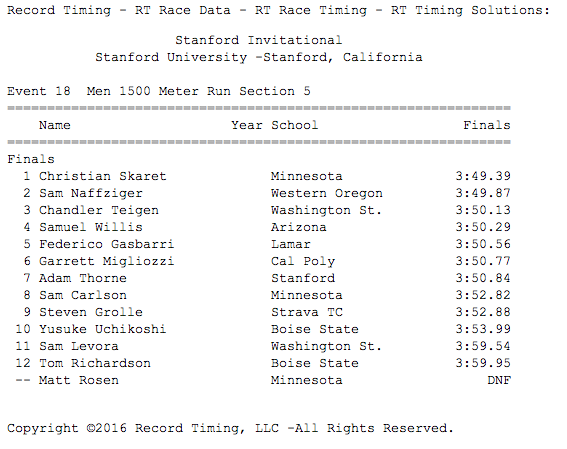 Sam Willis runs a 3:50.29 1500 and placed 4th at the Stanford Invitational! Jason Hillquist (COC) 1500 4:08.49 4th, Joel Estrada (COC) 1500 4:09.75 7th, Adam Driedger (Cuesta) 4:12.54 10th. 3/6 Caleb McClain ran at the "Nor Cal Opener" at Cal yesterday. He ran the 3000M and finished 3rd in the race in a PR of 8:43. On Feb 13, Sam ran a 4:10.91, a new PR at U of Washington Indoor meet.